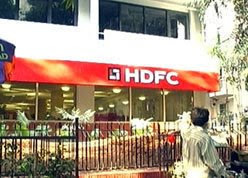 Housing Development Finance Corporation, founded in 1977, is the leading institution focusing on home mortgages.HDFC has a wide range of distribution network of over 250 outlets and 50 offices.HDFC's marketing efforts continue to be concentrated on developing a stronger distribution network. Demand from re-sale and new properties to remain strong barring urban areas. Pre-eminent return ratios and healthy asset quality fetch premium valuation. Valued on SoTP methodology, core business trading at 2.3x P/ABV of FY09E. Loan growth outlook remains positive, FY09 loan book growth at over 20% yoy. Liquidity conditions improving now, fund raising picks up. The quality of builder’s loan book, comprising of 12% of the total outstanding loan book, remains healthy. Liquidity crunch and constrains in raising funds may pressurize margins. At current price of around Rs.1500, the stock trades at 16 times forward earnings of Rs.90.Long term investors can buy/accumulate on declines, with a 12 month view for a good return. I just discovered your blog..and have bookmarked the same.